A recent assessment of mathematics performance around the world ranked the United States twenty-eighth out of forty countries in the study. When the level of spending was taken into account, we sank to the very bottom of the list. We are falling rapidly behind the rest of the developed world when it comes to math education-and the consequences are dire. 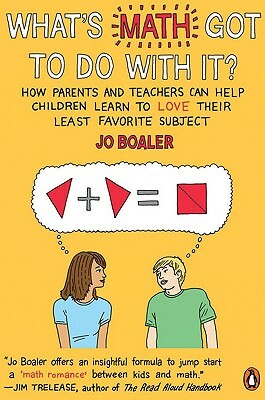 In this straightforward and inspiring book, Jo Boaler, a professor of mathematics education at Stanford for nine years, outlines concrete solutions that can change things for the better, including classroom approaches, essential strategies for students, and advice for parents. This is a must-read for anyone who is interested in the mathematical and scientific future of our country. Jo Boaler is a Professor of Mathematics Education at Stanford University. She was formerly the Marie Curie Professor of Mathematics Education at the University of Sussex in England and a classroom teacher in London and California. She is a regular contributor to national television and radio in the United States and the U.K., and her research has appeared in newspapers around the world, including "The Wall Street Journal" and "The Times"(London). She lives in Palo Alto, California. "For any parent who's ever heard a child declare, 'I hate math.'" " Parents and educators alike will count this book an inspiring resource." " Highly accessible and enjoyable for readers who love and loathe math."